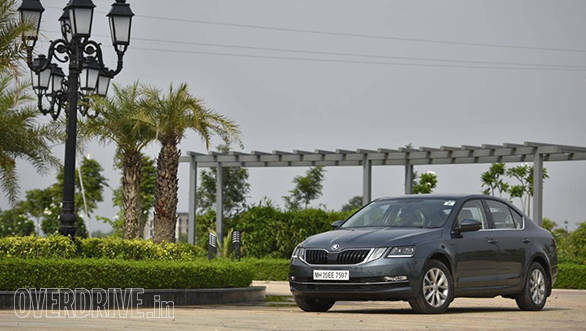 Skoda has been quietly working for the last three years to improve their image in India. In the last few years, their reputation took a massive beating on the back of a shoddy after sales service network. Things however are looking up, slowly but steadily. 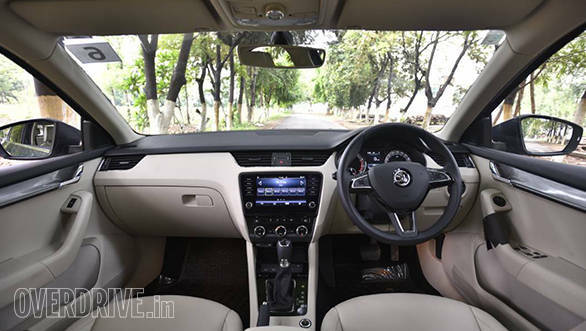 Skoda India claims that systems are more transparent and the company is quick to respond to customer service requirements. New features in the entire customer service chain are bringing customers back to Skoda. The next step obviously is to bring newer offerings that will strengthen the brand and customer confidence. 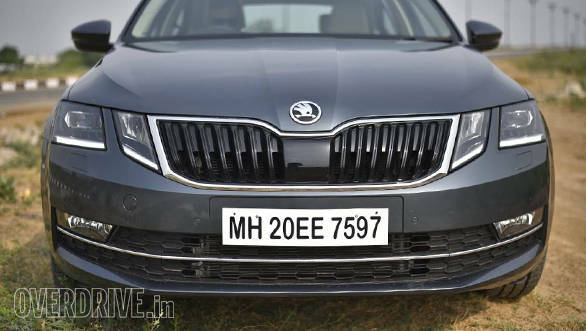 So over the last few months we have seen newer versions of the Superb and the Rapid being introduced and now Skoda is introducing a fresher Octavia. This also paves the way for the forthcoming Kodiaq and the Octavia RS expected in the market in the month of September. For now our attentions are focused on the Octavia, here is what is new and what it does for you. 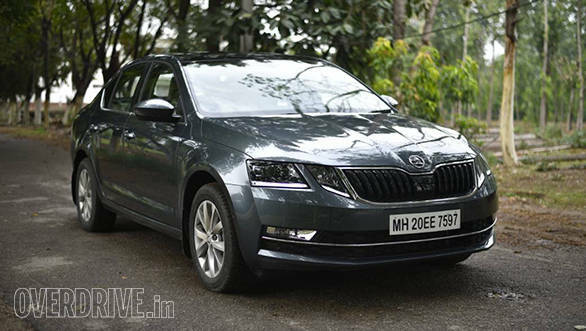 The revised Octavia has several design and styling flourishes that freshen the car. The changes however are subtle, so subtle in fact that they failed to elicit much response from passerby's. 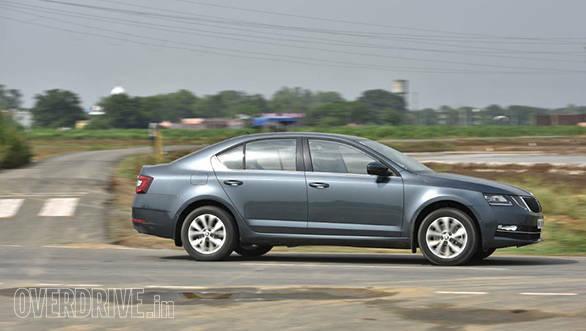 Save for a few enthusiasts in Chandigarh who spotted some of the changes and sped up in their cars to take a closer look at this new Octavia, the general populace remained oblivious. The front end sports the most detail changes overall. The headlamps have been split into smaller components housing the low and high beam in separate pods. The lamps on the far extremities are for the low beams, while the inner pods are the high beams. Under them on the bumper are the driving lamps. All the lighting elements are LED, and this has led to smarter and more effective illumination and a reduction in energy consumption. Another result is that emissions have dropped by roughly 1 gram per kilometre which may not seem like such a big deal here in India, but trust me, its important in the long run. The headlights are also adaptive which means they sense the illumination required and adjust the brightness and spread accordingly. The grille has a black mirror finish, the lower bumper has a chrome strip running across the length of it and there are subtle contours added to the hood that weren't found on the previous generation car. These contour changes have also come about since the track and subsequently the width of the car has increased, a change that also results in additional sculpting to the fenders. Does the Octavia look any nicer than before, yes it does! 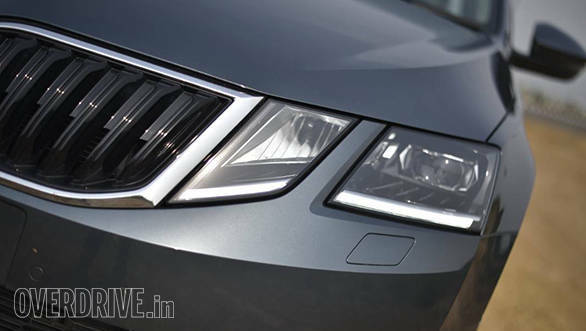 There is a more premium look and feel and all the brightwork enhances the upmarket proposition the Octavia offers. 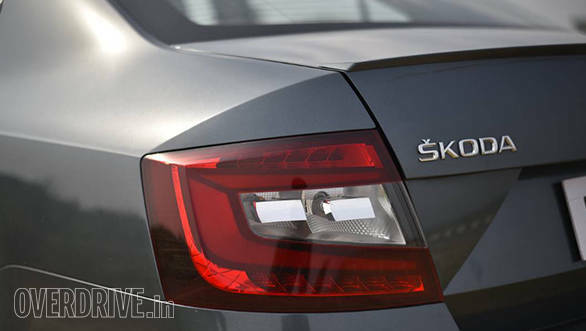 Even at the rear, the LED lamp array appears more plush and contemporary. Step into the Octavia to a significantly better cabin than before. The changes are more apparent here than on the exteriors. The two tone upholstery scheme continues but the colours have altered miutely. The beige and black theme continues and it could probably be because it's a new car, but the Octavia interiors look brighter. The door pads have plastic inserts whose appearance emulates brushed aluminum and it's a nice touch, giving the cabin a very premium and suave appeal. The fascia on the centre console has changed, a new touchscreen using capacitive touch like what you see on cell phones is employed. Set within a smooth black bezel it looks premium and functions immaculately. Lower down, the air con controls are also new, shiny and employ some clever stylized bits. Overall the dashboard is laid out and bedecked very smartly and it would be nice to see these design cues being carried forward onto future models as well. There aren't any significant mechanical changes, the Octavia continues to use the proven and familiar engine options utilized in the previous generation car. There are two petrol options, the 1.4-litre and the 1.8-litre direct injection turbocharged engines. The 1.4-litre engine with a 150PS power output and 250Nm of torque is matched with a 6-speed manual transmission. The more powerful and brilliant 1.8 TSI engine delivers 180PS of max power and 250Nm of torque through an automatic 7-speed DSG transmission that also uses paddle shifts for a more manual shift experience. This engine is absolutely delightful, max torque is at a peak from as low as 1250rpm and is available all the way to 5000rpm. This guarantees a superb driving experience, especially in a car that weighs just 1376 kilos. This ultimately leads to a power to weight ratio of 131PS per ton! Power delivery is scintillating and it takes just seconds to get into triple digit speeds. Now we haven't tested this particular engine but I'd wager it does a 100kmph in under 7 seconds. The transmission has also improved, its more refined and shifts are much quicker leading to better performance and honestly, I couldn't care about efficiency in this variant! If you want more miles per litre in a petrol the 1.4 engine option is what you're looking for. 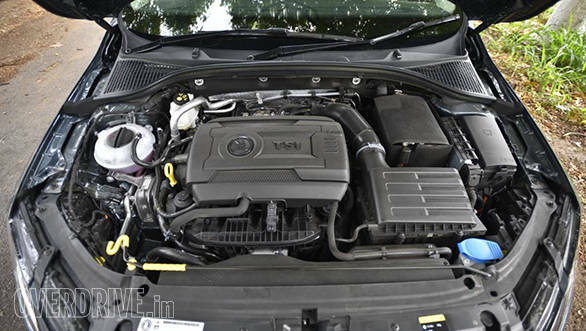 On the diesel front, the Volkswagen groups 2.0-litre turbodiesel (EA288) also continues its service. It is complemented by either a 6-speed manual or DSG automatic transmission options. The former delivers a claimed efficiency of 21kmpl while the latter delivers 19.5kmpl. On the suspension front, things continue to stay quite the same. Though as I mentioned before the rear track has increased. This means you get more stability especially at high speeds. 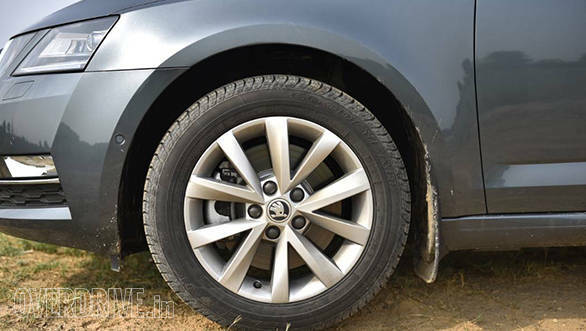 Rear track has increased by 30mm on the 1.8TSI variant since it employs a multilink axle. On the 2.0-litre diesel rear track has increased by 20mm to accommodate the compound link crank axle. The 1.8TSI that I drove felt composed, though there is mild body roll evident when you're driving in urban conditions. 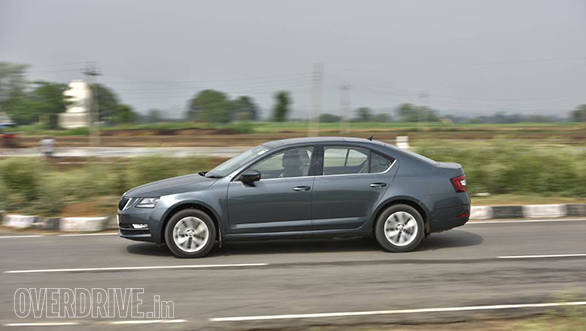 Out on the highways as your speeds rise the Octavia settles down and is more planted and firm. The new Octavia adds a ton of features to its equipment list. Key additions are the larger touchscreen that I mentioned earlier, you get carplay, android auto and even mirror link through that touchscreen, you also get handsfree parking which employs 12 sensors to allow the Octavia to perpendicular or parallel park itself. Another interesting feature especially for those who would prefer to be driven is a feature called the Boss Connect. 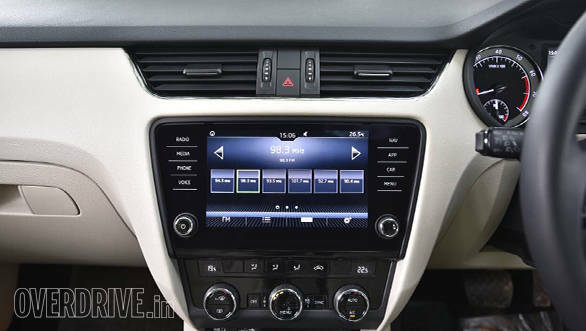 It allows the rear seat passengers to control the audio and navigation using a native app from your smartphone. Rear passengers also get 2 fast charging points in addition to air-con vents though you can't control blower speeds or temperature on these. And lets not forget the ost important one of them all, a sunroof! On the more critical safety front the Octavia offers 8 airbags on the Style and Style Plus variant, though the base Ambition variant gets both dual front and side airbags as well. The Octavia also gets a hill hold function and a feature called multi collision braking that continues applying the brakes on a car in the event of a collision that incapacitates the driver and makes him lose control. It enables the car to prevent crashing into further objects reducing the impact of an accident. Overall the new Octavia is a much better car on every front. Sadly, the segment itself is seeing a decline and the space for premium sedans such as the Octavia is diminishing. Still the second largest selling sedan in its segment soldiers on and now provides even better value. As for the price differential, I expect Skoda to charge a small premium considering the plethora of features on offer. If Skoda continues to back this up with renewed vigor, transparency and honesty where their after sales relationships are concerned, the new Octavia can make a stronger comeback than ever before!